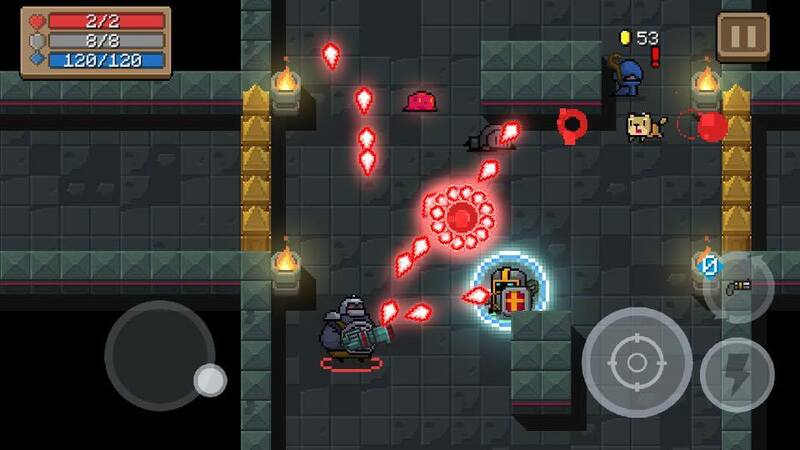 ‘Soul Knight’ Review – All the Guns. All of Them. Okay, not quite all of them. That honor goes to Enter the Gungeon (SUCH A GOOD GAME), but it doesn’t take long to see what the primary inspiration for this game probably was. 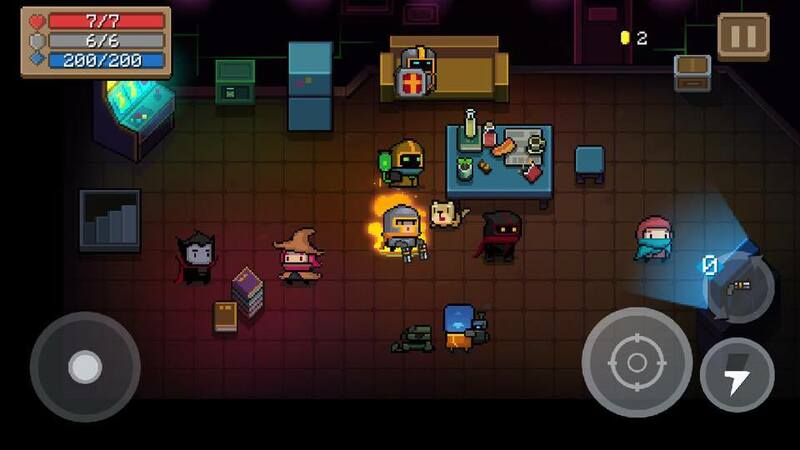 If you’re into the roguelike offerings of Nuclear Throne or Enter the Gungeon, this mobile game was made just for you. It’s solid to the core, and while it somewhat ironically lacks a soul or identity of its own, it revels in tossing pretext aside and getting to the action. Most importantly, especially for a lot of people who read this site, the economy is a glorious, unobtrusive, generous, beautiful thing. 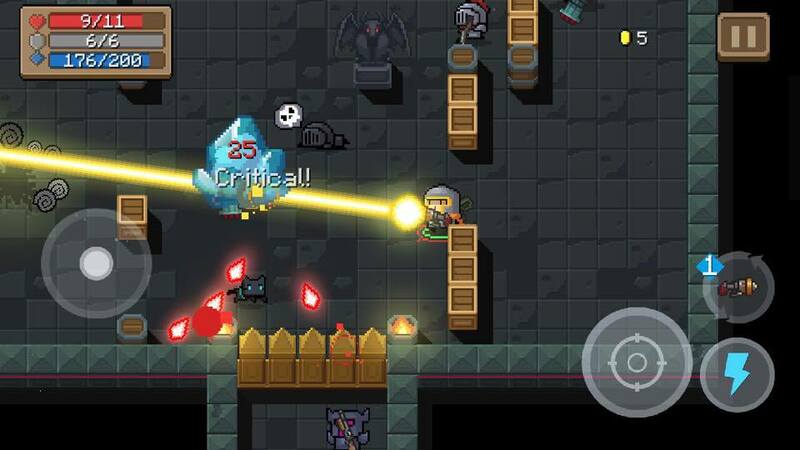 *wipes away tear* This is Soul Knight (Free). 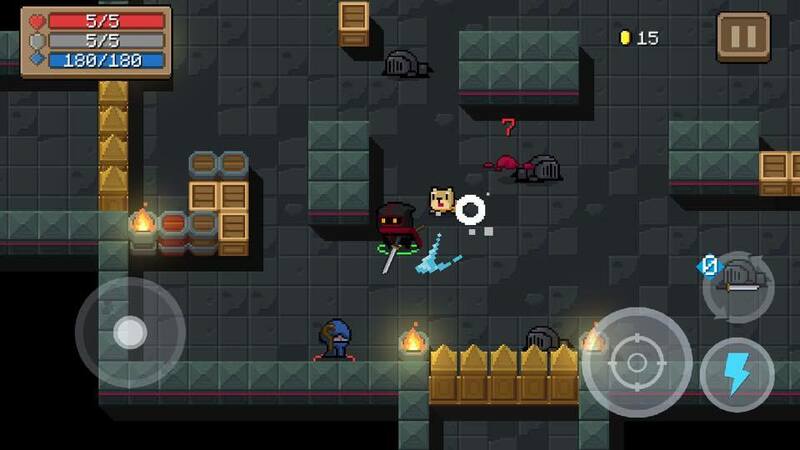 Brought to us by Zeyang Li and ChillyRoom Inc., developed in Unity, Soul Knight is quite clear even from the App Store description that it doesn’t care about the story and details so much. It wants us to have the fun and shoot the guns. 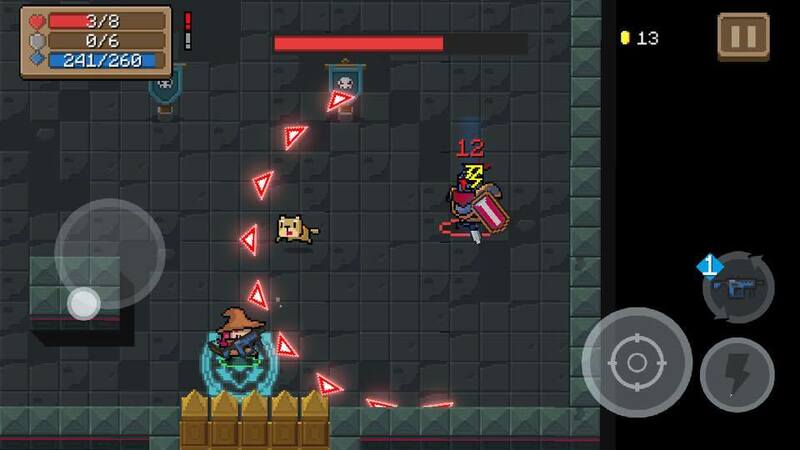 This is reminiscent of an OrangePixel Games take on Gungeon, like a Heroes of Loot ($3.99), though not quite as strong. You move through extremely symmetrical dungeon rooms and hallways fighting baddies that spawn whenever you cross the room threshold. You can’t shoot into the rooms from outside or vice versa, so all action is contained within, though you can see what to expect. Targeting is done completely automatically. You’ll shoot at the nearest target, letting you focus on dodging bullets and enemies. I’m generally OK with this, but it does make shooting at explosive barrels and such a pain. I’m the kind of gamer that simply MUST clear a room of crates and other destructibles before moving on. Right now, you can only aim in a direction by moving in that direction and it’s awkward. Combat is fine though. Considering how cramped some of these rooms are, I see why they wanted to emphasize your dodging, but I’d prefer a twin stick method as an option. Interestingly, this game employs a kind of Halo-esque recharging shield mechanic in the form of armor. You can take a hit or three if you need to clear a corner of room to hide in before recharging and suffering no health damage. The game boasts an arsenal of 120 different weapons, from your basic pistols, shotguns, and machine guns, to rockets, lasers, bows and arrows, melee weapons, magic staves, and plenty of silly nonsense weapons like plungers that launch little poos and a fish that shoots a laser beam, because tell them they can’t. Magic staves served all kinds of purposes, from summoning a couple weak blue balls to circle your character to an omni-directional blast, to summoning hordes of the freaking undead to fight for you. The real joy in games like this are the weapons that you get and wish you never had to put down or feel extremely sad to lose. Like the Fusion Drill. My god, that beam weapon was glorious. Each area consists of 5 levels culminating in one of two boss fights, chosen randomly. Every so often you’ll get access to passive buffs between levels. These include basics like max health upgrades, immunity to fire, poison, or traps, decreased store prices, shorter charge ups for bows and beams, and more unique stuff like being able to hit bullets back at enemies with a melee weapon like a light saber or drastically increasing the chances you’ll find health potions in crates, which is just so nice. They show up everywhere after that. I’m just scratching the surface here. Naturally you’ll come across new random weapons in chests, but synergizing your weapon load out with your passives can make for godlike runs. You always have a pet, which starts as a kitty, to help you fight enemies. You can buy other pets, but they seem to just be different skins. You can also find and recruit 3 random mercenaries to fight for you, provided you have the gold. These guys aren’t slouches either. They stay around until they die and are a big help, lasting a long time. I should probably go over the currencies. Gold resets every run, like coins in Binding of Isaac ($14.99). You can use them at stores and to hire dudes. Gems are your premium currency, used for buying new characters and pets, upgrading your existing characters, among other permanent buffs. You can also play a slot machine in the starting lounge in the hopes of winning a super strong weapon to start your run with, or even just more gems. The last collectible is energy. All weapons, except starting weapons, melee weapons, and certain special weapons, are fired with energy instead of ammo. Your character is the magazine for this energy, so you can’t regain it by picking up a new gun or anything. Weapons have varying amounts depending largely on power and other utility. My first run I actually didn’t even notice this, and swapped my starting pistol for something else. If you run out of energy and have no energy-free weapons, it’s all up to your pet and mercenary companion to fight for you until you find more in crates or dropped by corpses. I always, always, always equip a melee weapon if I can. They’re superb for clearing rooms of crates and such, can destroy bullets, and if you have one with enough reach, you can even hit enemies through walls with them, but this is true of certain melee enemies too. Every class brings different health and armor to the table and energy amounts to the table, but what really sets them apart are the active cooldown skills. The knight, for example, can dual wield any weapon for a short time, naturally costing twice the energy per shot. But don’t discount a knight dual wielding his starting pistol. It’s a formidable combo. These skills can be used infinitely and you only have to wait for them to recharge, which they do so very quickly. Always remember to use your skills, or let them recharge before you enter a new room, especially if you can see it’ll be a tough one. I played for a couple hours only using the knight before it started to feel grindy and a little boring. As stated earlier, the economy of this game is a wonderful thing. It’s completely free, and there are no ads. Unless you choose to watch an ad for 200 gems. I’m not gonna lie, I threw on some Ultimate Beastmaster on Netflix because I just learned it was a thing and spam watched ads to fully upgrade my knight. You will eventually run out of ads to watch but I got through at least 30. I am not above such tactics. If you’re going to spam watch ads, do it from the fridge. If you do it from the TV, you’ll have to walk away and towards the TV each time to activate it again. You can spend gems on a crate with a random free secondary weapon to start each run and you only have to buy it once. Certain characters cost gems, but 3 can only be bought through IAP for one dollar each. You have the option to revive once per run for 200 gems or by watching one ad, or you can buy a 2 dollar revive pass for permanent free revives. Even if you decide to buy gems in-app, the amounts are very generous, netting you 25,000 for 3 dollars, which is the highest purchase. No $99.99 gem pack whale hunting nonsense here. I bought the pass and all three characters for a total of 5 bucks and am completely pleased with my purchases. Now, I know this review is long, but I have to get into some faults. This is a lovely game, and I wholeheartedly recommend you try it. But it’s lacking polish and the progression doesn’t ever really hook you like most popular roguelikes do. My main gripe is with the lack of information. For example, if you’re picking up a new weapon, you can see it’s stats, but not your current weapons stats to compare, so you need to swap them back and forth to check. You can’t see stats on store bought weapons before buying either. There are class statues that you can find and worship for some bonus, and I have no idea what they do. Picking up the same weapons repeatedly and racking up kills on enemies makes them level up in the cellar. Is this just an achievement thing? I still don’t know what certain icons even mean exactly for weapon stats. Eventually you’ll get access to a stack of books that increases your critical… what? Critical hit chance? Or damage? Plus other little nitpicks, like the hallways all being way too long. There is literally nothing in them. They just serve to make backtracking take longer. I like this game, and it’s fun in short bursts, but it doesn’t scratch that itch like it should. There’s no zing. Progression is slow and upgrades often have minimal impact. Despite the huge variety of weapons, new runs don’t usually feel that varied. For some reason the shops almost always have duplicates of the weapons in your hand. Sometimes you’ll find or buy a super awesome gun, but that’s rare. I don’t know if they need to tweak their algorithms or what, but It all becomes a bit too repetitive. If you do manage to beat the game, you’ll gain access to hard mode. All that said, a solid, free, gameplay focused mobile game with no price gouging? I want to hug the developer. Definitely pick this up and try it. You’ve got no reason not to, especially if you’re into any of the roguelikes/roguelites that I mentioned throughout this review.